PLACES. Juan wants to go to London. He wants to know new places. Last year he already mentioned that he would prefer a shorter holiday in Formentera, the little Mediterranean island where we go every July, and to go to new places. So this year we will shorten a week our stay in Formentera, and I have just booked to go to London the first week of October. We have also agreed that next year it will be Nicolas’s turn to choose a new place to discover! They are already 10 and 8 years old, such grown up boys! Now I've got 4 months to plan the trip. My old house at Roehampton, the deer at Richmond Park, the River Embankment at Putney, Chelsea Market...to show them my old places. Juan quiere ir a Londres. El año pasado ya dijo que prefería acortar nuestras vacaciones de Julio en Formentera e ir algún otro sitio además, para conocer más sitios. Así que este año iremos a Formetera una semana menos y acabo de reservar billetes para ir a Londres la primera semana de Octubre. Ya hemos quedado que el año que viene le tocará a Nicolás elegir sitio. Con 10 y 8 años, ¡qué mayores ya! Ahora tengo 4 meses para planear el viaje. 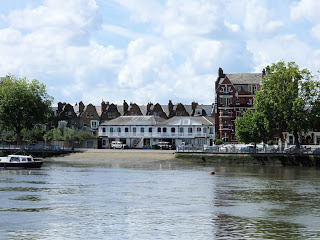 Mi antigua casa de Roehampton, los ciervos en Richmond Park, la orilla del Támesis en Putney, Chelsea Market... mostrarles mis viejos rincones. A visit to Lonon. So much to see andnever enough time to do it all. Best to focus on one or two things in order to avoid complete exhaustion. The Soane Museum, if you have never been is a gem! I am glad that your children wish to discover new places! Travel is so important to a child's development! It all sounds wonderful! Your kids will grow up with a good understanding of the world....so necessary for evolution. It would be hard to give up a Med Island for a city....but showing your children around London will be truly marvelous......lucky kids! October...rainy, but nice. planning is the best part because you have months of things to look forward to. (egg and watercress sandwiches will only get you so far).